The type of rubber beading to be used depends on the application. There are basically two types available. 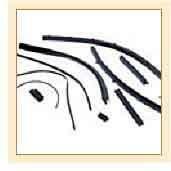 "P" type rubber beading: This comes as a strip and adhesive must used separately, adhesive especially formulated for use with rubber. Foam rubber beading: This comes backed with an adhesive strip. The rubber beading used in a car doors protects the car body from water damage. Door Seal or window seal rubber beadings prevent water and dirt getting inside, causing damage or rust while at the same time eliminate drafts and wind whistles. The rubber beadings never crack and restore proper seal around the entire door. They are easy to install. Rubber beading is also used to prevent any scuffing between the sliders and the body. Synthetic rubber beading is used in helmets to protect peripheral edges against damage due to abrasion.